The Stones River Craft Association’s 18th Annual Studio Tour will take place the weekend before Thanksgiving, November 18 through November 20. This year, six area studios will be open to the public. Ramsey Hall’s Jewelry Design Studio, featuring her hand-crafted jewelry and the work of two guest artist, is one of those venues. Ramsey is showcasing a new line of work that incorporates ancient roman glass. This beautifully aged, iridescent glass is combined with antiqued silver and copper to create one-of-a-kind wearable art pieces. Joining Ramsey this season are guest artists Teresa Hays and Marc Barr. Hays, whose work has been featured on Nashville Public Television’s “Tennessee Crossroads”, hand-dyes marbled silk scarves, ties, and clothing. Barr, an award-winning ceramicist, is displaying his textured, sculptural teapots, mugs, and dinnerware. 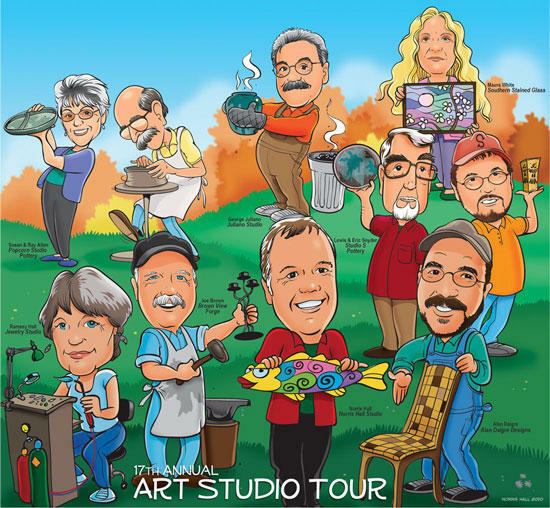 The studios will be open Friday, November 18, and Saturday, November 19, from 10 a.m. - 5 p.m., and on Sunday, November 20, from noon to 5 p.m.
For more information, maps, and pictures of works to be found at the studio tour, visit our website at: www.artstudiotour.org.